Summer’s here. Earthbound as we are, the season’s warm temperatures and lazy nights give us ample opportunity to go outside, stretch out under the summer night sky with a few friends, and glance up towards the cosmos. This summer, I recommend you start getting a little more acquainted with that night sky, if only to impress your friends with your vast stargazing know-how. Fair warning: If you are planning to show off from a city, you’re setting yourself up for a slight disappointment. First and foremost, you need night skies with as little light pollution as possible. 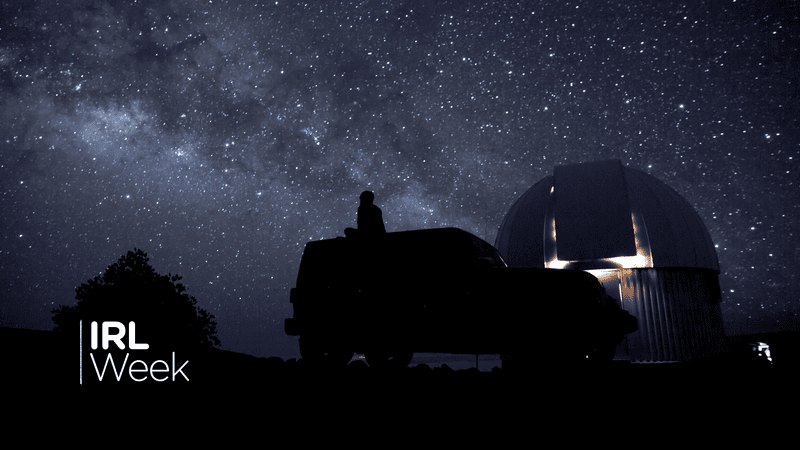 Dark sky maps can direct you to some of the country’s most light-pollution free areas, which lend themselves to quite the celestial sights. If you, like me, are near the NYC area, a one hour drive to Harriman State Park offers no major city for miles and a large field of view over the lake. If you’re willing to go a little farther, Cherry Springs State Park is 4.5 hours away from the city. It has perhaps the truest dark skies you can find in the eastern U.S. The good news is, once you find that clear dark sky, you’re basically set: You don’t need to shell out big bucks for a telescope. Our naked eyes are actually a solid instrument for stargazing. It’ll only take about 10 minutes for your eyes to adjust to the newfound darkness as your pupils dilate, allowing more light to enter and revealing fainter light sources. Note: For the purposes of this post, I’ll select celestial objects found in the northern hemisphere’s summer. What cosmic treats graze your night sky will vary by latitude and time of year. There’s no shortage of things you can find and point out to your friends with your naked eye alone. Take constellations: Almost all of them can be seen with the naked eye. These groups of stars are the result of a cosmic pareidolia, meaning our species’ need for pattern recognition. There are 88 constellations in total, each one named after their apparent form or a mythological creature. A handy smartphone app like SkyGuide or, if you’re old-school, a star chart can guide you in the right direction. “The big dipper” and “the little dipper” A line through the big bear’s right most stars point to Polaris. If you were to extend a line from the Big Dipper’s two rightmost stars, it would point to Polaris, the North Star, at the tail end of Ursa Minor or the “Little Bear.” As the name would suggest, if you find the North Star, you know which direction is north and can orient yourself accordingly. This fact has made the North Star a boon for travelers of all kinds. Yet, Polaris won’t be the North Star forever, because of how the Earth’s spin axis slowly shifts over time. Like Ursa Major, Cassiopeia, Cepheus, Draco, and Ursa Minor are constellations that light up the northern sky all year long, while Aquila, Cygnus, Hercules, Lyra, Ophiuchus, Sagittarius, and Scorpius grace our skies during the summer months. Though it sometimes gets confused as such, the Big Dipper itself is not a constellation. It’s an asterism—a grouping that can be composed of stars from a single constellation or from several constellations. There are a plethora of seasonal asterisms. During these summer months, we can feast our eyes on the aptly named Summer Triangle. It’s made up of the three brightest stars from three different constellations—Aquila, Cygnus, and Lyra. To find it, look east as the night falls. If your skies are truly dark, a great swath of stars will pass through the Summer Triangle—a streak of bright specks freckled across the sky. This is the edgewise view into our own galaxy, the Milky Way. Once you’ve mastered finding the Summer Triangle, you can confidently point out the Milky Way. The Summer Triangle and the Milky Way galaxy. Constellations and asterisms are great, but there’s perhaps nothing as impressive as when nature puts up a show. As far as meteor showers go, the Perseid shower tends to be the most popular but this upcoming one—from mid-July to late August—is also set to the best one of the year in the northern hemisphere thanks to a favorable moon, according to Space.com. From the night of August 11 to August 13, the shower will be at its peak, and excited onlookers will be able see about 60-70 meteors per hour—fleeting streaks of light flashing across the sky. When you’re out with your friends witnessing this celestial event, be sure to point out that Comet Swift-Tuttle. The comet whose debris creates the Perseids is the largest celestial object known to pass the Earth on the regular. The night sky is not devoid of artifice, either. On a clear night, you can glance up at what seems to be a star readily marching across the sky overhead. This is, of course, not a star but a satellite, a man-made object that can reflect sunlight off its iridium panels toward Earth. This appears as a bright flare called an iridium flare. Online tools like Heavens Above and Spot The Station can inform you of when a satellite or the International Space Station will be flying overhead. And if you want to kick your night sky viewing up a notch, bring a pair of binoculars with you. They’re relatively cheap and portable—and they open up many more stunning celestial objects for you and your friends’ perusal. I recommend 10x50 binoculars meaning 10 times the magnification and lenses that are 50mm in diameter. Celestron has some of the best binoculars designed specifically for stargazing. A closer look at The Big Dipper. Another look at the Big Dipper, this time through your binoculars’ lenses, reveals that what might have appeared to be a single star—the second one from the saucepan’s handle—is actually a pair. Ancient people in the Middle East, especially the Bedouins, used this “two star” system, Mizar and Alcor, as a test for good vision. In reality, if you look at these stars through an even more powerful instrument, you’d see that the entire system is actually composed of six stars. And while there are five bright naked eye planets—Mercury, Venus, Mars, Jupiter and Saturn—you can glean a lot of information by peering at them with binoculars. Take Jupiter. If you steadily look at the gas giant through your binoculars, you should be able to parse four bright points of light near it. These are some of Jupiter’s moons. Also known as Galilean satellites, these objects were first seen by Italian astronomer Galileo through one of the first telescopes in 1610.